I’m always looking for ways to decorate on a budget. Many times you can take one thing and turn it in to something else – you just need to look for its potential. 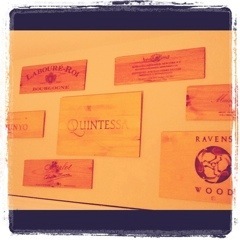 And example of this is some artwork I made out of old wine crates. I took the sides of the crates off and then attached hanging brackets to them. It’s a very easy project. You could even stain the wood if you prefer other colors.